Fees: Entrance fees are charged per vehicle from Memorial Day weekend to Labor Day. From the intersections of Interstate 78W and Route 31N, follow 31 north to the third traffic light – Van Syckels Road. Turn left and continue 1.5 miles to the Park entrance which is on the left. skating, basketball courts, and open fields to set up for volleyball, soccer, etc. Surrounded by the rolling hills of Hunterdon County, Spruce Run Recreation Area is popular with picnickers, swimmers, fishermen, boaters and campers. The reservoir was one of the first water supply facilities to be constructed and operated by the state and covers 1,290 acres with 15 miles of shoreline for recreation. Spruce Run is the third largest reservoir in the state after Round Valley and Wanaque reservoirs. Through the Carry-In/Carry-Out Program you can help us keep your parks clean and beautiful by carrying out the trash you carry in. Bags are provided throughout the site. Thank you for your cooperation and remember to recycle. Closed for swimming and boat rentals for the season. See you in May 2019! November - February: 8 a.m. to 4 p.m.
March: 8 a.m. to 6 p.m.
April 1 through the Friday before Memorial Day Weekend: 8 a.m. to 7 p.m. The Tuesday after Labor Day through September 30: 8 a.m. to 7 p.m.
October: 8 a.m. to 6 p.m. The Highlands Trail extends over 150 miles from Storm King Mountain on the Hudson River in New York south to Riegelsville, New Jersey, on the Delaware River. A 2.6 mile section takes hikers through a maple forest, a pine forest and along the water’s edge through the park before exiting onto NJ Fish and Wildlife property. Alcohol is prohibited. Pets are prohibited in overnight facilities. A non-refundable service fee of $5.00 will be charged to the customer for each reservation. Changes to the reservation that occur prior to the Start/Check in date will incur a non refundable fee of $5.00. If the total fee is greater then or equal to $50.00 then a fee of $5.00 will be charged. If the total fee is less then $50.00 then the fee of $2.00 will be charged. Campsites: 67 tent and trailer sites with picnic tables and fire rings. Flush toilets and showers are within walking distance. Open April 1 through October 31. New Jersey Residents: $20 per night; Non-Residents: $25 per night. Our campground is open from April 1st through October 31st for family camping—no group sites are available. Each site is equipped with a picnic table and fire ring with attached grill. Modern restrooms with showers are located on either side of the campground. Reservations or walk-ins are accepted. Pets and alcoholic beverages are prohibited. Shelters: Three shelters. Cabin-like structures with wood stove for heat and two double-deck bunks, which sleep up to four people. Sites include a fire ring and picnic table. Open April 1 through October 31. New Jersey Residents: $48 per night; Non-Residents: $60 per night. A Special Use Permit is utilized to accommodate a specific activity or event being conducted over a short duration. There are two types of special use permits: Non-Commercial and Commercial and fees are based on NJ residency and Non-residents. A completed application must be submitted to the park/forest area where the activity or event is being held at least 90 days prior to the event. If the special use or event is extremely large or complex, at least one-year’s prior notice is recommended. Twenty-nine species of fish are contained within the waters of Spruce Run including largemouth bass, catfish, sunfish, yellow perch and carp. Trout, northern pike and hybrid bass are stocked by the NJ Division of Fish and Wildlife. For fishing regulations please refer to the NJ Fish and Wildlife Digest. Bow Hunting is permitted in Spruce Run Recreation Area Monday through Saturdays in designated areas only. Please contact the park office for maps and information. Spruce Run offers a variety of waterfowl and deer hunting (Bow only) seasonally. The Clinton Wildlife Management Area is adjacent to the recreation area and is open for public hunting. 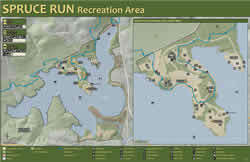 Maps and information may be obtained by visiting the Division of Fish and Wildlife Hunting website. The Park staff offer a variety of historical and natural interpretive programs seasonally. Contact the park office for a schedule of programs and to register. Program fees may apply. New Jersey Resident $100 per day, plus applicable parking fees. Non-Resident $150 per day, plus applicable parking fees. New Jersey Resident $125 per day. • Groups of 20 or more people shall reserve picnic facilities at least five days in advance. Such group use is not permitted on Holidays except as authorized by the Superintendent. Reservations for picnic areas are handled by the individual park area offices. Reservations can be made over the telephone using a credit card, or by mail using the Group Picnic Reservation form* downloadable here. Payment in full of the appropriate group picnicking fee must accompany this application. Motor boating (electric and gas—10hp limit), sailing (25 feet in length and 30 feet above the water line height limit), canoe/kayaking, windsurfing. Trailer launch ramp and cartop launch area. Rentals (908-638-8234) available seasonally and boat storage (dry) available year round. Call for information. Also visit Round Valley Recreation Area’s website for information on similar (except rentals) boating activities as well as scuba/skin diving. The outfitters listed below will be offering their services this summer at Spruce Run Recreation Area at the boat launch. Park patrons can sign up for lessons, fitness classes, yoga and excursions. Classes are on Stand Up Paddle Boards (SUP), Kayaks and canoes. For more information contact the outfitter directly at the number or email address provided. Swimming is permitted in the designated swimming area while lifeguards are on duty. Please check our swimming schedule prior to your visit. Visitors will find a beach complex containing changing areas, restrooms, showers, a first-aid station, and a concession building where food and beach supplies may be purchased. Inner tubes, rafts and other flotation devices are not permitted in the swimming area. Only Coast Guard approved life jackets are permitted. Pets are prohibited on the beach. Grilling is prohibited along the beachfront including the posted grassy area. There is a playground and open fields to accommodate various ball and net games. Many special events take place at Spruce Run. These include walk-a-thons, sailing regattas, watershed clean-up days, triathlons, and weddings. During the winter months, many visitors cross-country ski, ice fish, and ice boat at the recreation area. You may contact the recreation office for snow conditions or visit the local weather channel site at: http://www.weather.com/weather/local/08809. When is the Park open/closed? The park is open year round. From Memorial Day weekend to Labor Day, operating hours are Monday through Friday from 8 am to 8 pm, and weekends or holidays from 7 am to 8 pm. In the off-season, call for times. Are pets allowed? Yes, on a leash no longer than 6 feet. Not in campgrounds or on beach. Are alcoholic beverages permitted? Alcoholic beverages are not permitted in any of New Jersey’s State Parks. I go to the Park a lot during the summer, can I get a discount? There is a season pass available for unlimited access to all of New Jersey’s State Parks. You may purchase a decal for your vehicle or if you are a New Jersey resident who is 62 or older, you may acquire a free senior citizen pass. We would like to have a family reunion at the Park. Can you accommodate us? Spruce Run (as well as several other State parks) offers a Group Picnic Area which is available for a fee. Call for specific information. Are there hook-ups for R/Vs? At present, there are no hook-ups available at New Jersey State Campgrounds. However, there is a sanitary dump station available at Spruce Run for our registered campers.